In the summer of 2014 I began working on a new body of work as I prepared to sell my work at Longs Park Art & Craft Show in Lancaster, PA. I was concerned that I didn't have enough time to make new enamels and complete the goldsmithing required to make them into finished pieces of jewelry. My wife solved my problem by rummaging through my studio and all of the trays of samples and studies I had made over the years. She spread them out on a desk and started to design bracelets and necklaces. The Green Necklace to the right was one of the first of this new series. Part 2 of this series was designed and made in Winter 2014 as I prepared for the Atlanta ACC show. I named the series "Divergent Elements", and began to make new enamels to join with already existing samples and tests from more than 37 years worth of enameling. This Design Process could be called a "Collage Collaboration", as my wife and I would go back and forth moving pieces around until we found a combination we liked. Pat would design a few groups, and I would look at them for awhile that night and make changes. Then she would come back the next day and move things around some more. I was learning to let go and trust the process and allow myself to exist in the chaos of not knowing how these would turn out. 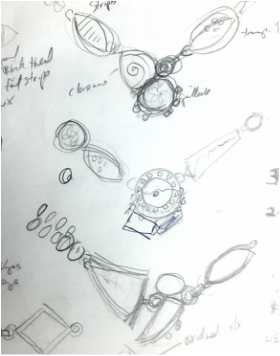 I also began sketching in order to quickly create some images of how these enamel components would join together into a finished necklace. Individual settings were made for each enamel, and then I began the assemblage process of soldering links and adding gemstones. The final pieces were really satisfying.